Being eco-friendly was once considered a stereotype for all of the crunchy granola folks out there, but oh, how times have changed. Everyone’s all about going green these days, including hot A-listers like Gisele Bundchen and Leonardo DiCaprio, so if you’re not already onboard, it’s time to take the plunge. We have an easy way for you to help preserve the earth and look great at the same time—new sustainable Gucci Eyewear by Safilo Group. In August, four new models will be released that use innovative acetate which contains a much higher percentage of natural material. Also available in August are two bio-based sunglasses from the Gucci Eyeweb collection. These shades are made from castor-oil seeds, which help to reduce CO2 emissions from the production process of the material itself. Already planning ahead for next year, Gucci will reduce their carbon footprint even more by switching up their packaging within the first six months of 2012 and eyewear catalogues will use Forest Stewardship Council (FSC) certified paper. 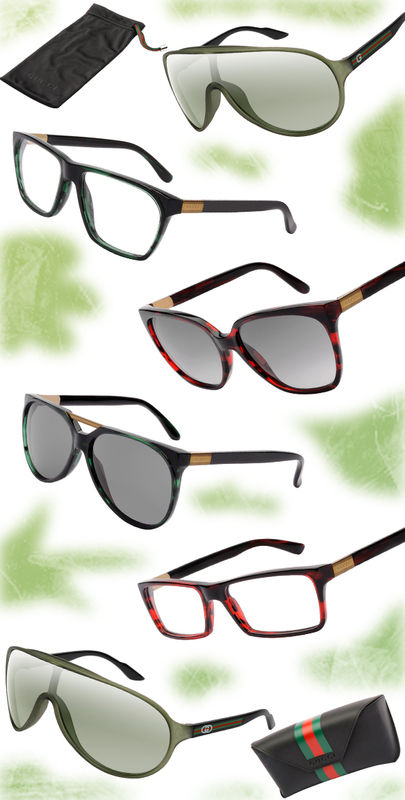 As always, Gucci didn’t disappoint and all of these eco-friendly specs and shades are designed to perfection. August will be here before you know it, so don’t forget to pick a pair up as an end-of-summer treat!